The night before World AIDS day, Heroes of HIV prevention, LGBT rights and community health were among nine people and organisations who were honoured at the 2018 Asia Pacific HERO Awards gala in Bangkok on Friday night. 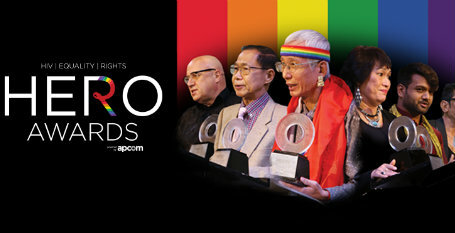 The night before World AIDS day, Heroes of HIV prevention, LGBT rights and community health were among nine people and organisations who were honoured at the 2018 Asia Pacific HERO Awards gala in Bangkok on Friday night. The significant work done in our Communities in Asia, sometimes in very challenging circumstances, is very often overlooked and it’s great to see this work being recognised. The significant work done in our Communities in Asia, sometimes in very challenging circumstances, is very often overlooked and it’s great to see this work being recognised. Wonderful! I am so proud they were recognized for their achievements and hard work. May many more take up the cause and fight for the rights and well being of The LGBT community.